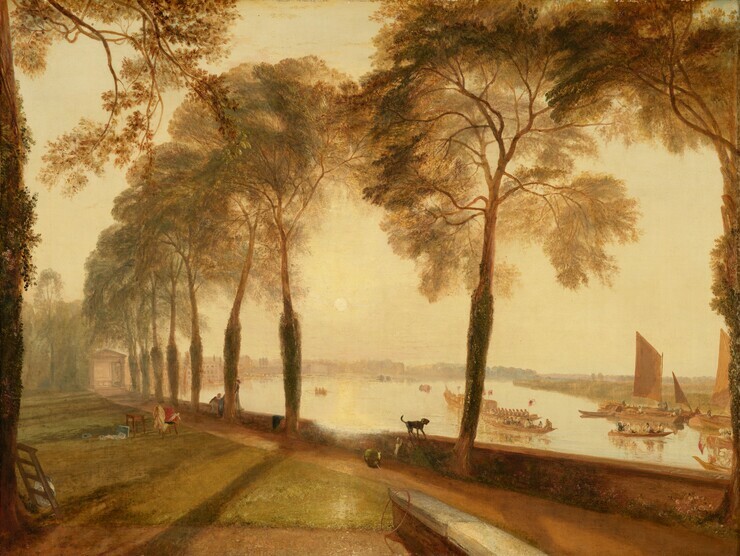 The landscape painters Turner and Constable were influential exponents of romanticism, an artistic movement of the late 1700s to mid-1800s that emphasized an emotional response to nature. Turner, who traveled extensively, often infused his dramatic seascapes and landscapes with literary or historical allusions. 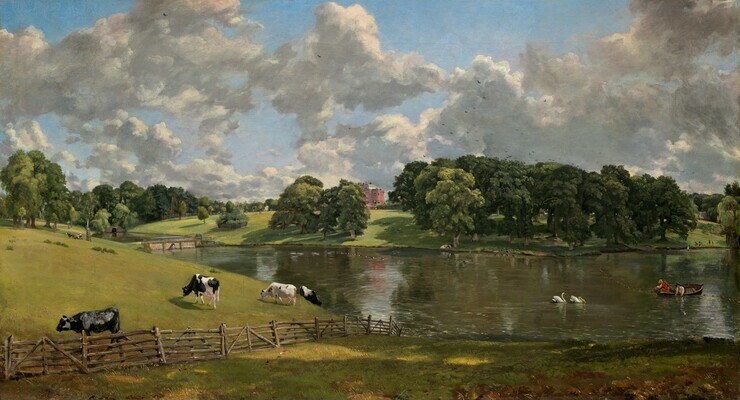 Constable, who never left England, preferred more straight forward depictions of placid rural scenery. 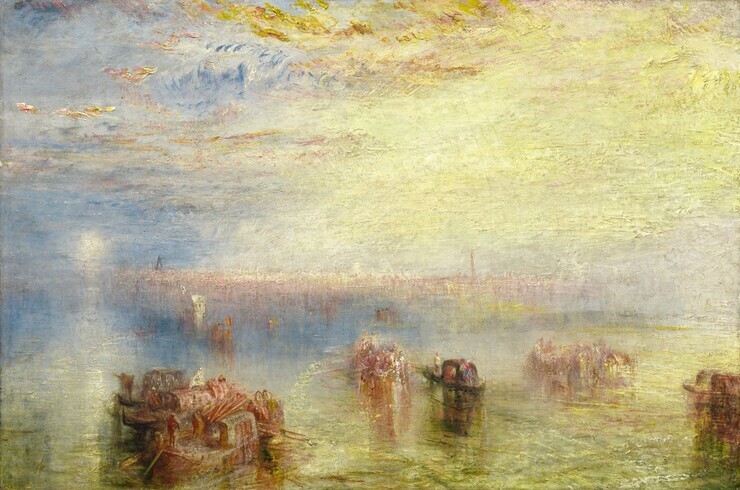 Working in the studio from sketches and his imagination, Turner blended his oil paints in fluid layers of translucent color, called glazes. 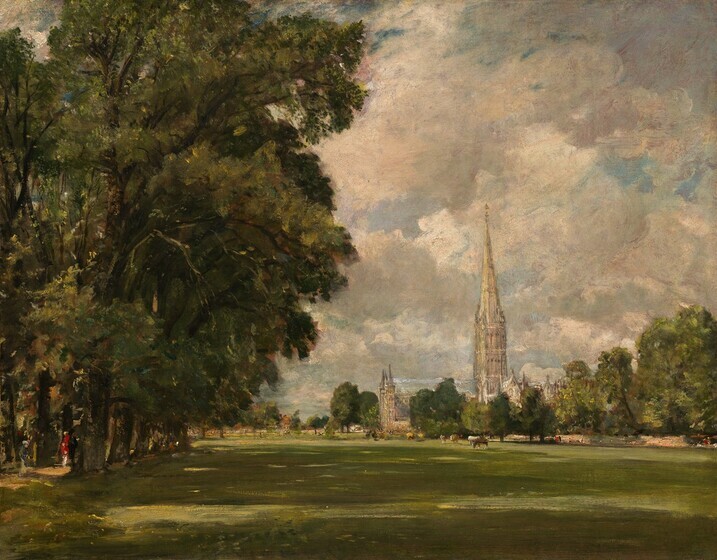 Constable, sometimes painting directly outdoors, applied flickering touches of thick, opaque oils. 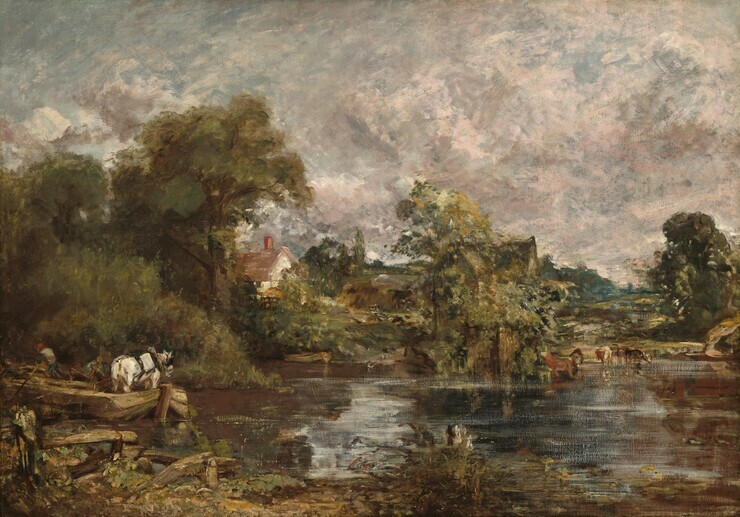 Despite their differences in temperament and technique, Turner and Constable evoke the same worship of nature that imbues the literature of their contemporaries, the romantic poets Wordsworth, Coleridge, Byron, Shelley, and Keats. Centered in the panoramic design, the red brick manor house stands out by reason of its warm color in an otherwise cool scheme of blues, greens, and grays. Constable wrote about the “great difficulty” of incorporating the thatch-roofed deer barn. To add this requested motif, he cleverly sewed about an inch of extra fabric to the canvas at the far right. Then, in order to restore the composition’s symmetrical balance, he stitched a similar strip to the left side, where he showed the owners’ daughter, Mary Rebow, driving a donkey cart. When the Gothic cathedral was finished in the 1300s, its grounds were walled or enclosed; this Close forms a lush, marshy park. The couple strolling through the Close’s avenue of elms may be John Fisher, the Archbishop of Salisbury, and his wife. Their nephew, an archdeacon and art patron, was Constable’s closest friend. This personal souvenir, kept by the artist, freshly observes the sunshine dappling the lawn. With long shadows falling from the west, the time is early evening. The canvas was executed spontaneously on the spot, and its brown underpainted layer is still visible beneath the trees. 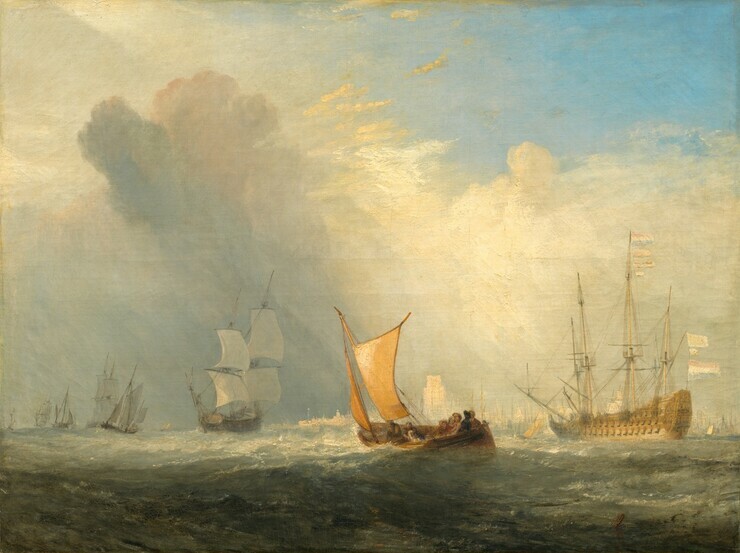 Turner, who earned an early reputation for producing accurate topographical views, opened his own private sales gallery, where he exhibited this turbulent seascape. Based on notes in the artist’s sketchbooks, the scene is the wide mouth of the Thames joining the North Sea, where the smaller River Medway further churns the waves. To the south, the town on the far shore is the seaport of Sheerness. 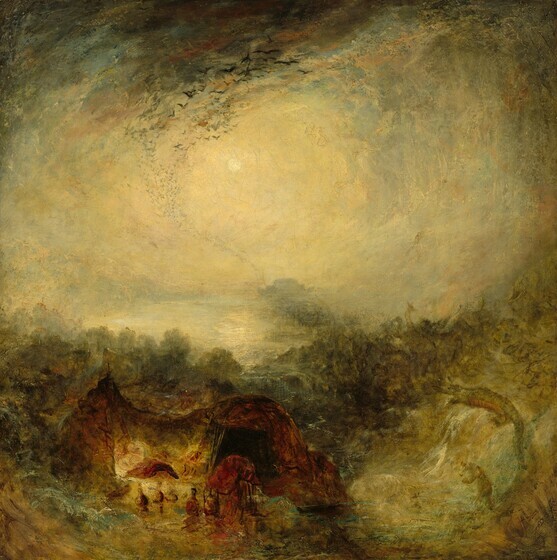 To heighten the storm’s impact, Turner artfully manipulated the lighting in this composition. The sails at the right, for instance, are brilliantly silhouetted against the dark clouds. In actuality, however, the sun is obscured high in the sky behind the thunderheads, making it impossible for sunbeams to strike those ships from the side. A fashionable London suburb, Mortlake Terrace lies next to the Royal Botanical Gardens at Kew, visible here on the distant bend of the River Thames. This is one of a pair of views commissioned by the owner of a town house, The Limes, named after the magnificent lime trees lining its terrace. Both scenes daringly portray the blazing disk of the sun itself, which here flashes a reflection from the stone parapet. The companion piece, now in New York City’s Frick Collection, depicts the house at sunrise. Reversing the view, this picture looks west over the garden at sunset after the children have abandoned their toys. A black dog barks at the Lord Mayor’s flag-decked barge. This dark accent, which enhances the summer evening’s hazy paleness, was a last-minute addition. Just before the Royal Academy show opened in 1827, Turner cut the dog out of paper, stuck it onto the wet varnish, and touched it up with highlights and a collar. 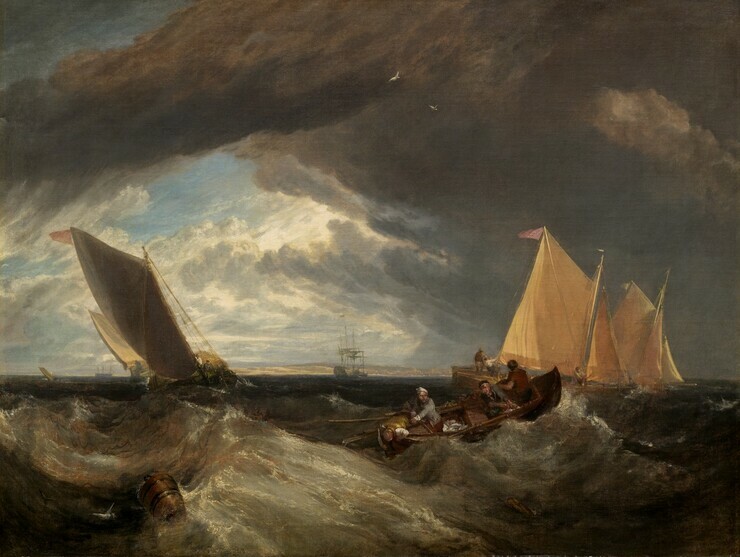 This seascape was exhibited in 1833 at the Royal Academy, where Turner taught as the professor of perspective. Conquering the problem of creating a believable sense of space across a featureless expanse of water, Turner anchored the carefully aligned design upon a small passenger ferry. From this foreground focus, a row of larger ships moves backward over the choppy waves on a diagonal line, generating a remarkable illusion of depth. The warship’s Dutch flags and the skyline of Rotterdam pay tribute to Turner’s predecessors, the marine painters of seventeenth-century Holland. In particular, the low horizon and cloud-swept vista derive from harbor scenes by Jan van Goyen and Aelbert Cuyp. 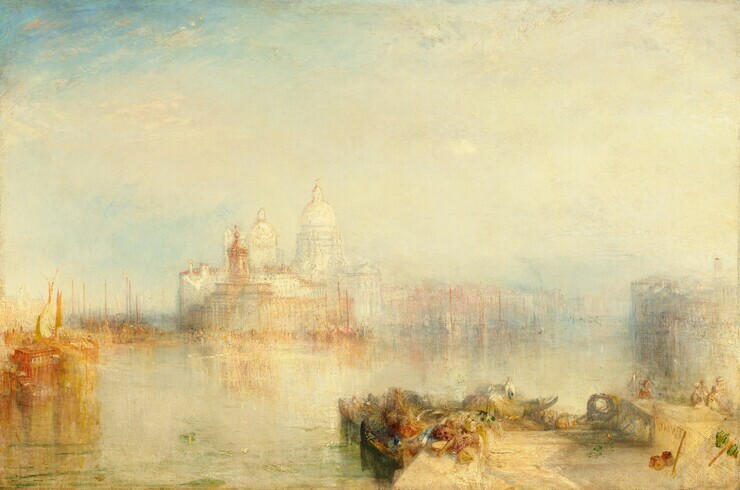 At the “especial suggestion” of a British textile manufacturer, Turner devised this Venetian cityscape as a symbolic salute to commerce. Gondolas carry cargoes of fine fabrics and exotic spices. 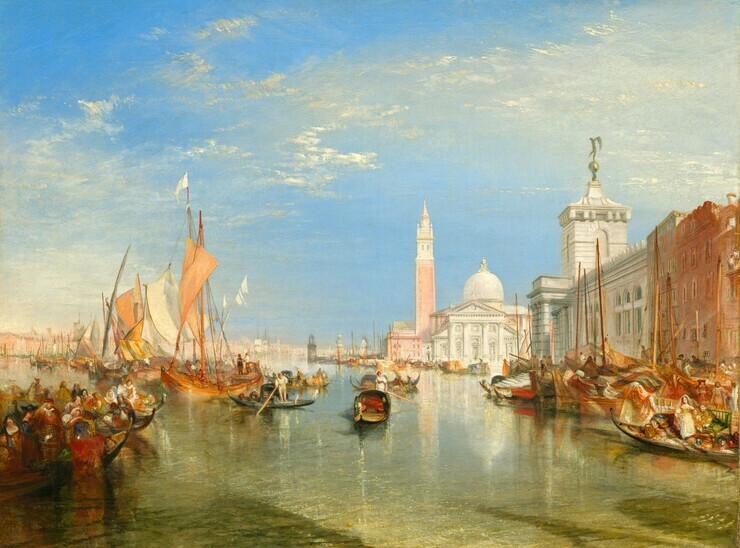 On the right is the Dogana, or Customs House, topped by a statue of Fortune, which Turner greatly enlarged in size. Moreover, the Church of San Giorgio Maggiore has been pushed very far back in space, making the Grand Canal seem much wider than it really is. These theatrical exaggerations and the precise, linear drafting of the architecture owe much to Canaletto, an eighteenth-century Venetian painter whose art glorified his city. 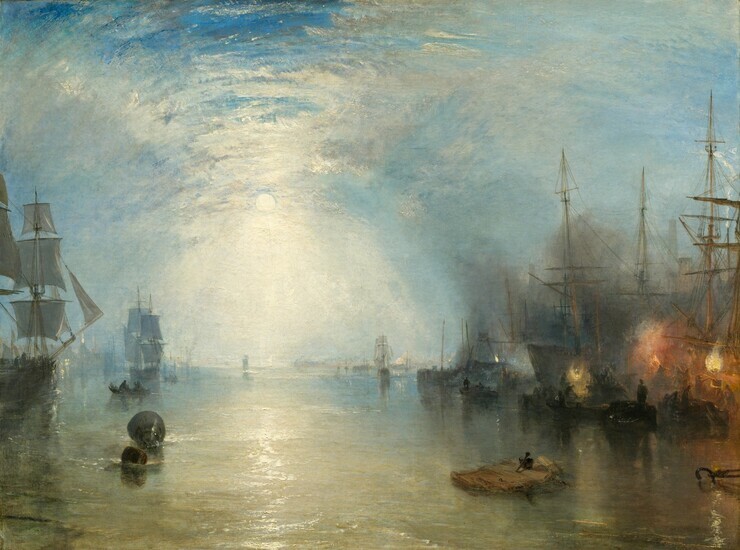 At the 1834 Royal Academy show, critics gave enraptured praise to the scene’s radiant, sparkling waters. The next year, another commission from the same patron resulted in its moonlit companion piece, Keelmen Heaving in Coals by Moonlight. Commissioned as a pendant to Venice: The Dogana and San Giorgio Maggiore and shown at the Royal Academy in 1835, this canvas creates a total counterpoint in mood and meaning. The Venetian scene is far away in the Mediterranean Sea, concerns luxury goods, and glows with warm daylight. This North Sea view—a familiar sight to the British public—reveals sooty, modern industry chilled by the colors of a winter’s night. In classical mythology, Pluto, the god of the underworld, abducted the maiden Proserpine to make her his wife and the queen of Hades. 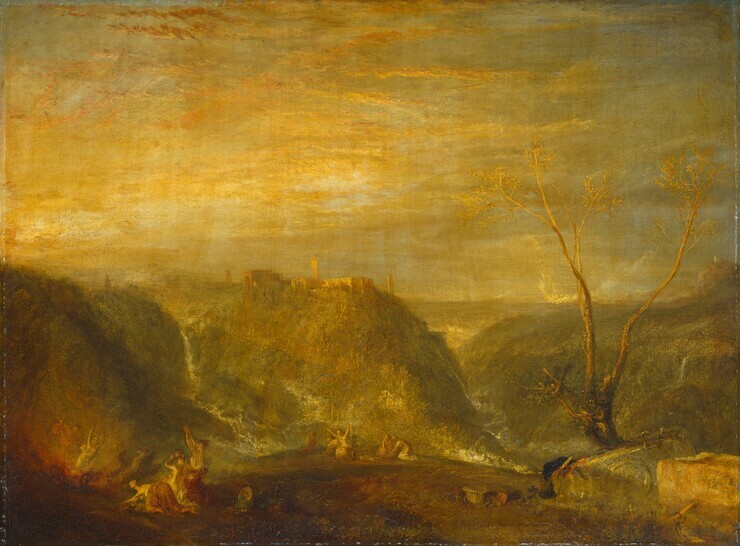 Turner, in this entry from the 1839 Royal Academy exhibition, depicted the moment when Pluto’s fiery chariot erupts earthward, burning the meadow and terrifying Proserpine’s attendants. The setting, equally dramatic, is a fantasy based upon the hills, gorges, waterfalls, and ruins at Tivoli, an ancient village near Rome. While Noah and his wife sleep in their tent, the biblical Flood begins. In a spiraling vortex of rain and moonlight, birds and beasts head toward the distant Ark. This is a preliminary version of a canvas shown in the 1843 Royal Academy. Now in London’s Tate Gallery, the final work uses stronger color contrasts but is equally evocative and sketchy.